Native Extensions allow Haxe code to call Objective-C, C++ or Java code, thereby allowing your games to take advantage of native functionality and APIs. These extensions accomplish this by getting pointers to those native functions and then calling them. Although the exact details differ slightly between iOS and Android, the underlying concepts are the same. Read our article on Engine Extensions. Check out the test-native extension (under [WORKSPACE]/engine-extensions) to familiarize yourself with the parts. test-native shows how to create an Alerts extension that works both on iOS and Android. We reference this example throughought this article. [WORKSPACE] refers to the path to your Stencyl workspace (find it using Debug > View > View Workspace Folder). If you’re writing an iOS or Android extension, you must add a couple items to your computer's "path" before proceeding, so that our bundled install of Haxe is recognized by the system. Note: If you prefer to use your own install of Haxe, you must use Haxe 3.1. Don't forget to install Neko too. Run the following in Terminal. Add the following path to your system path. Run the following in the command line. Note: This section walks through the test-native extension and explains how the system works. The test-native extension adds Alerts to iOS and Android games. Every iOS extension consists of 3 parts. C++ code that sets up a mapping between those function pointers and Objective-C code. Objective-C code that does stuff in iOS. The purpose of the Haxe portion of the extension is two fold. It exposes an API for your game (and blocks) to use. It fetches function pointers to native code and calls them. Open up NativeTest.hx. Find the following code near the bottom (~line 42). In this snippet, we're getting a "function pointer" to ios_alert, a C++ function. The first parameter is the name of the function. The second parameter is the number of parameters that function takes. Now look for this (~line 24). Here, we're calling the function, whose pointer we fetched as described above. The #if(cpp && mobile && !android) are pre-processor flags that only let this code execute on certain targets. In this case, this is a roundabout way of saying "only do this on ios". 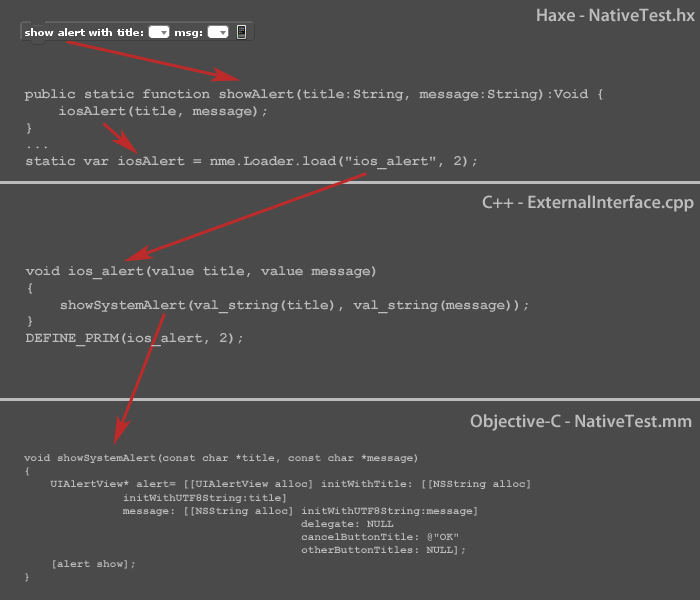 Part 2 - The C++ "Mapping"
The purpose of the C++ code is to establish a mapping beween Haxe and Objective-C.
As you can see ios_alert shows up again. This time, it's a function. That’s where that function “pointer” is coming from in the Haxe file! The DEFINE_PRIM part specifies how many parameters the function has. showSystemAlert() is a direct call to a function in Objective-C. val_string() casts an arbitrary value to a String. Now, let's look at the Objective-C part of the extension. Objective-C is typically where the "meat" of an iOS extension is implemented. You may have noticed that ExternalInterface.cpp imports NativeTest.h (peek at the top). If you open project/include/NativeTest.h and project/iphone/NativeTest.mm, you can see that this is plain old Objective-C.
To recap, an iOS extension effectively consists of 3 parts. Haxe source that fetches function pointers to native code and calls them. ExternalInterface.cpp provides those native calls and acts as the “glue” between Haxe and Objective-C.
Objective-C (headers and .mm implementations) act as the implementation. Now, we’ll look at Android. Thankfully, the story is quite similar. Every Android extension consists of 2 parts. Haxe code that your game calls. 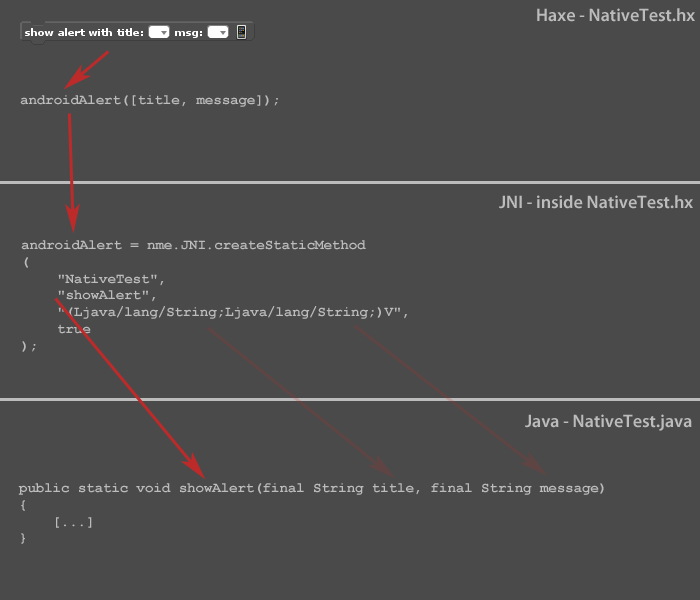 This Haxe code fetches function pointers via JNI in order to let your Haxe code call Java code. The Java code that does stuff in Android. In contrast to iOS, Android doesn't have that intermediate layer of C++ to worry about, but the Haxe part is a little bit more complex to compensate. Just like, in the iOS case, the purpose of the Haxe portion of the extension is two fold. Open up NativeTest.hx and find this line (~line 30). Here, we’re getting a "function pointer" to showAlert(), a Java function on the native side of things. The syntax is more complicated due to the use of JNI, the standard way of exposing native code to Java. Think of JNI as the rough equivalent to what ExternalInterface.cpp was doing for iOS, just in a more compact form. Here, we're calling the function, but the syntax is a little different. Instead of padding in the parameters directly, we're wrapping them inside an array. Aside: In some extensions, you may encounter an alternate approach where the array is pre-defined and passed in. For example, our Ads extension does this. There’s the underlying Java implementation for showAlert(). Notice how showAlert() takes two Strings as its arguments? That’s why that JNI call above looked the way it did. It turns out that JNI is serving the same purpose that ExternalInterface.cpp did for iOS. It’s the glue that connects native code to Haxe. It just happens at the Haxe level, rather than being in a separate file. Getting the JNI syntax correct is a topic in itself. To recap, an Android extension consists of 2 parts. Haxe source that fetches function pointers to native code through JNI. This is summarized in the following graphic. Now, we'll look at a few more topics. If you need to include an External Library, you can specify which libraries you wish to include inside include.xml (in some extensions, it's called include.nmml). In this example, we're importing a system framework (iAd) using the <dependency> tag. Aside: <ndll> is used to import the compiled form of your iOS extension into any projects that use it. In this example, we're importing a 3rd party framework that is placed under the frameworks/ subfolder of the extension. Note that the attribute name is path, rather than name in the example above. If your Android extension needs to import libraries, it gets more complicated. Within that folder are two subfolders and a few extra files. One subfolder is a *libs folder that contains the tapdaq.jar library we want to import. <android> is used to specify the path to the Java sources for the extension (the portion that you write). The value for the extension attribute is the package name for your sources. You place the sources under [DEPENDENCY]/src/ where [DEPENDENCY] is the folder specified in the <dependency> tag. This page covers the purpose of each <dependency>, <ios>, and <android> in more detail. Documentation is pretty thin for this, so our recommendation is to check out existing extensions for examples of how to lay the files in your extension. If you make a change to an iOS extension, you must compile the extension, which will output libraries to its ndll directory. This step is not required for Android. To compile the extension, run the build script (located under the project/ subdirectory of an extension). This compiles the iOS source and generates the .a libraries. For example, if you wanted to build the test-native extension, you would cd to [WORKSPACE]/engine-extensions/test-native/project and then run ./build. Tip: If you get errors about Neko or Haxe not being recognized, re-read the Setup section of this doc. You must edit project/Build.xml before compiling your iOS extension. 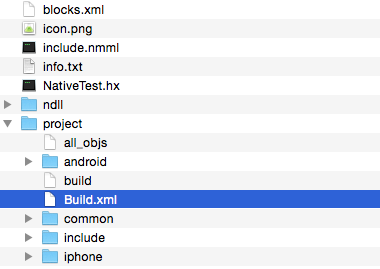 project/Build.xml controls the name of the outputted library files and also serves to specify what .mm (Objective-C) files to include (and compile). Our recommendation is to view existing examples to figure out what to edit - it's a lot easier than trying to type it up from scratch. For example, take this sample from an extension for Tapdaq ads. Search for mm. This is where you'd specify all the .mm source files for the extension. Search for tapdaq and replace each instance with the name of your extension (in lower case). To implement Events for your extensions, you would need to know how to get the Objective-C (or Java) code to send notifications back to Haxe. For example, if the player completed an in-app purchase, you'd want to inform the player if the purchase succeeded and do something in-game in response to that. Learn how to implement Events for iOS / Android. If you need to refer to the “main class” or “Activity” in Android speak, call GameActivity.getInstance(). By default, code runs on the main thread rather than the UI thread. This can pose problems if you need to change the UI (e.g. and can lead to crashes or unexpected behavior. Tip: There’s another method calls runOnHaxeThread that does the opposite - guarantees running on the HaXe/main thread. I've rewritten this article and greatly expanded the core parts. Some parts have now been split off into their own individual articles.